Mediate BC is hosting BC’s second annual Conflict Resolution Week, October 17-24, 2015. 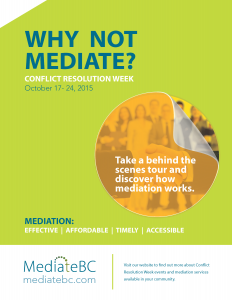 During the week of October 17-24, Mediate BC and its Roster mediators will be organizing events throughout the province to build awareness of healthy ways to resolve conflicts, including mediation. #WhyNotMediate is the event’s official hashtag. “Mediation is a great option for many people because it’s private, has more flexibility in resolutions and typically is faster and less expensive than going to court. It saves people time, money and stress and allows them to get back to what’s important to them,” says Mediate BC’s CEO Monique Steensma. Steensma is supported by studies that show mediation to be an effective, affordable, timely and accessible option. Check out free events in your local community. For questions and information contact: 1-877-656-1300 ext. 104 or training@mediatebc.com. The Beginner’s Guide to Finding Legal Information now available as a Clicklaw Wikibook! We need & want your feedback.